Kansas defensive tackle Daniel Wise (96) takes a knee as trainers tend to safety Mike Lee during the third quarter on Saturday, Sept. 4, 2017 at Memorial Stadium. 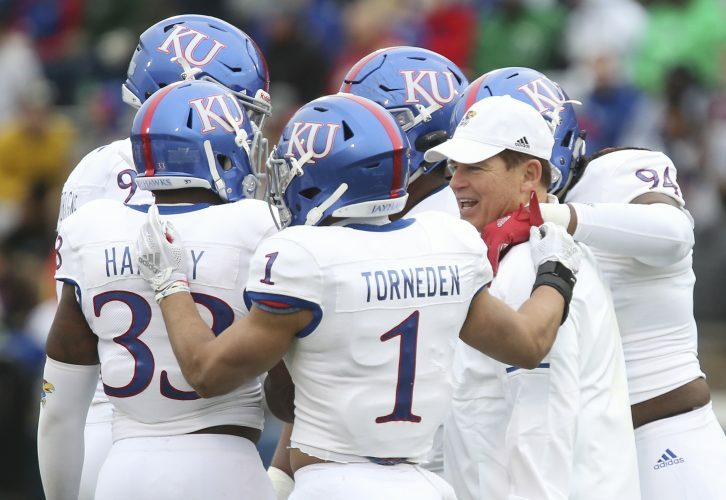 In a game the Kansas football team needed desperately to win, the Jayhawks’ defense spent the majority of what proved to be a 38-9 victory for previously winless Baylor without a key member of its secondary. Junior Shakial Taylor, who has started every game this season at cornerback since transferring to KU from Mesa Community College (Ariz.), suffered an undisclosed leg injury in the first quarter, on the Bears’ third possession. A scoreless game at the time, it didn’t remain that way long, as freshman BU quarterback Charlie Brewer soon found his way and put up career numbers — 23-for-29 passing, 315 yards, three touchdowns, no interceptions — against the Kansas secondary. Mayberry, a sophomore who filled in as a starter for corner Hasan Defense two games earlier this season, surrendered a couple of big pass plays on BU’s first touchdown drive in Defense’s place and finished seven total tackles and a pass breakup. 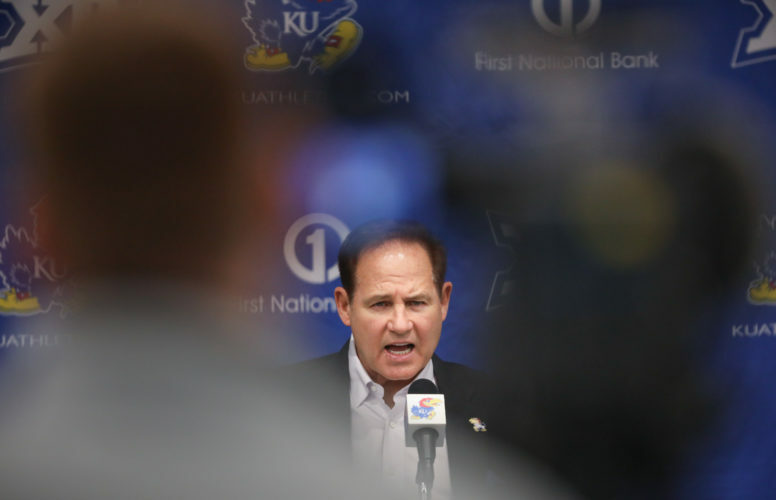 The Kansas secondary suffered another blow in the third quarter, when sophomore safety Mike Lee hit his head while attempting to break up a pass in the end zone. 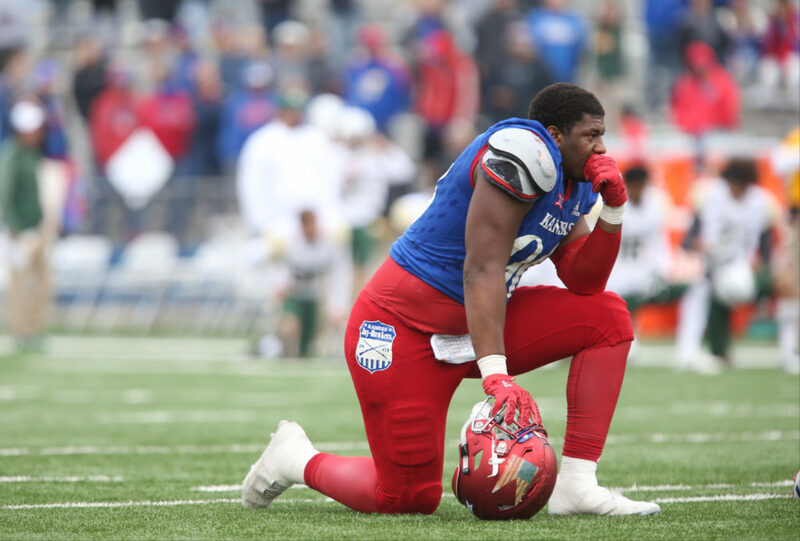 Lee, who made seven total tackles prior to the scary moment, remained on the turf for a few minutes as KU trainers addressed his injury and many of his teammates took knees and watched nearby. Dineen, though obviously upset with the loss for Kansas (1-8 overall, 0-6 Big 12), was happy to see Lee walk off the field with the help of KU staffers. “Don’t get me wrong, it is super-important, but to be healthy and for Mike to get up from that, that’s more important than the outcome of the game,” Dineen said. No update on Lee’s status was provided following the loss. 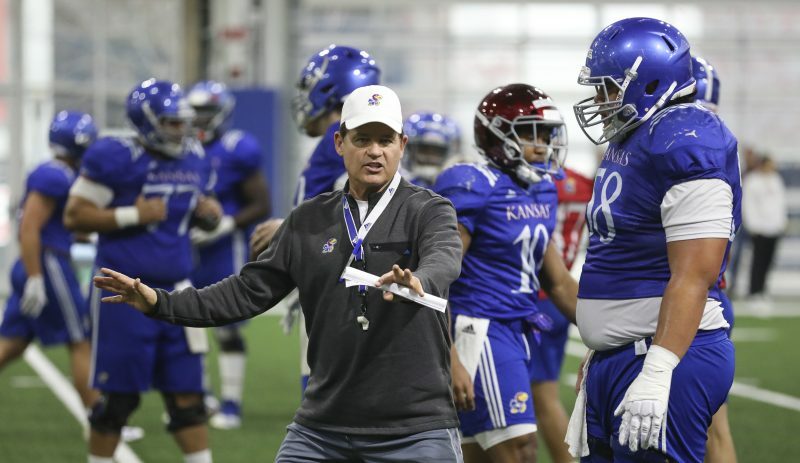 Kansas started Clyde McCauley III at right tackle for the second straight game in place of the injured Zach Hannon. Junior defensive tackle KeyShaun Simmons started for the first time in his career, replacing Josh Ehambe, who did not play. In the Memorial Stadium press box Saturday, a spot was reserved for former Lawrence Journal-World sports editor Chuck Woodling, who died earlier this week. A placard featuring Woodling’s name sat in the middle spot of the front row. A moment of silence for Woodling was observed in the press box, as well, prior to kickoff. Services for Woodling are scheduled for Nov. 18, at 11 a.m., at First Presbyterian Church, 2415 Clinton Parkway.